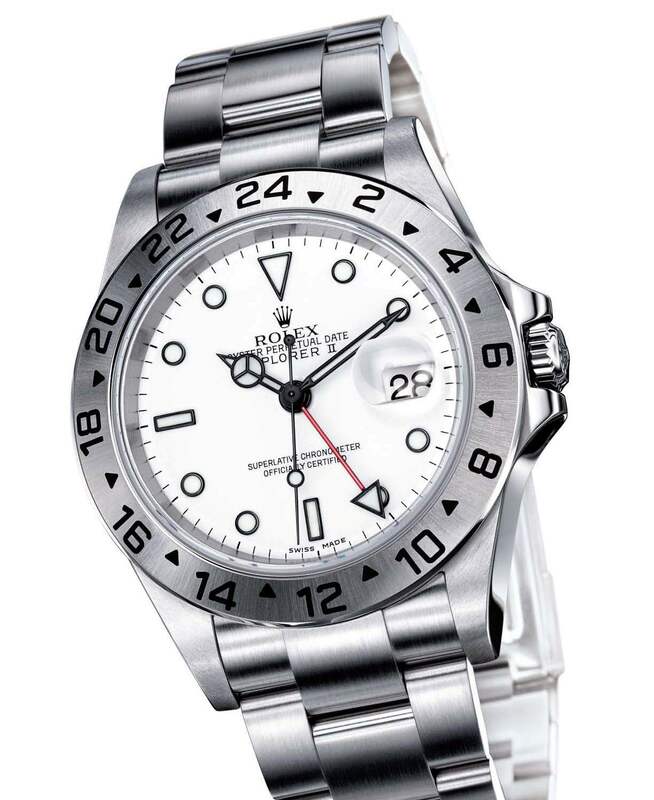 Rolex Oyster Perpetual Explorer II is an extreme professional watch, and highly valued by mountaineers and speleologists, for its rugged durability and reliability in countless expeditions to every corner of the globe. Equipped with an additional, red 24-hour hand and a fixed 24-hour graduated bezel, the Explorer II allows simultaneous reading of the time in two time zones and makes it possible to distinguish night hours from day hours, a necessity for speleologists or polar explorers. It is equipped with a 12-hour hand that can be set independently from the minute hand, thus allowing the wearer to set the watch for a new time zone while the minute hand continues to function, maintaining the exact time. The Oyster Perpetual Explorer II has over time confirmed its qualities of robustness and reliability during numerous expeditions. The original Explorer model was the watch that, in 1953, accompanied Sir John Hunt, Sir Edmund Hillary and Tenzing Norgay on their victorious ascent of Everest. Self-winding, equipped with a Perpetual rotor and certified by the Swiss Official Chronometer Testing Institute (COSC), the Oyster Perpetual Explorer II is guaranteed waterproof to a depth of 100 metres (330 feet). It features a sapphire crystal with a Cyclops lens and a Twinlock winding crown protected by shoulders.